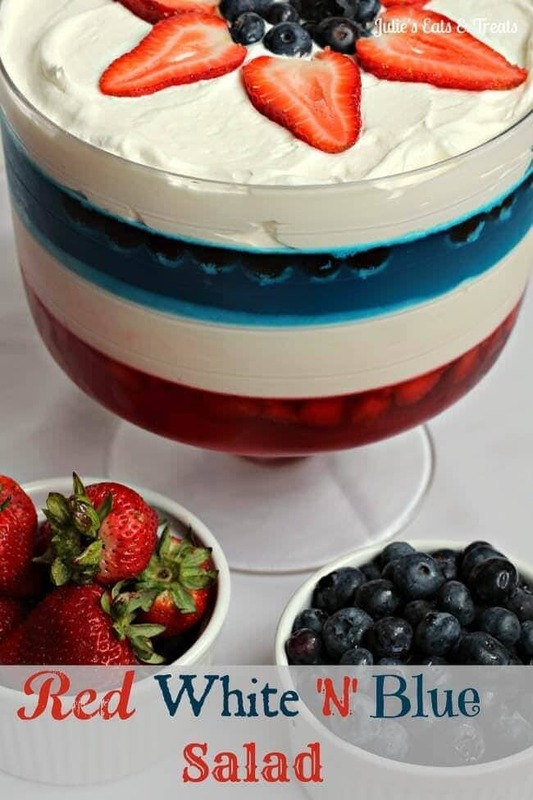 Red, White & Blue Salad ~ a refreshing, patriotic dessert packed with fresh blueberries and strawberries! 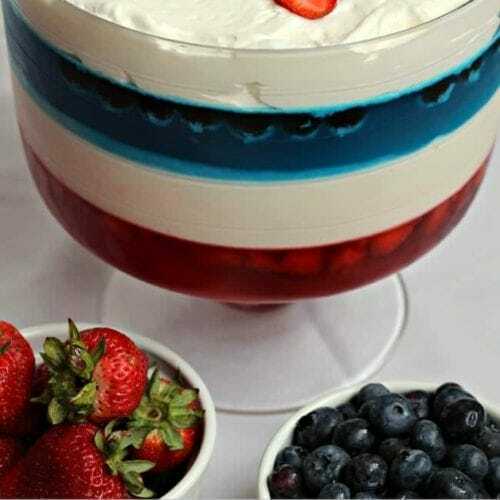 I just LOVE this time of year when all the Red, White & Blue posts are coming out of the woodwork like this Red, White & Blue Jello Salad. It makes me so proud to be an American. Corny kind of right? Well that’s how I roll. A bit corny. Maybe I just really like themed food. It makes it easier for me to decided each week what to try and make for you guys! I figured this one would be a hit because I know when I saw this pretty salad I got all excited. Yes. Food does that to me. This salad is a bit of time-consuming thing. Don’t worry it’s not hard by any means. It just takes a little bit of time and patience. I promise you when you walk into your 4th of July party with this beauty and the ooo’s and ahhh’s come out it will be totally worth it. Just plan a few days ahead of time so it has enough to set. Love this? Then I know you’ll love Strawberry Pretzel Salad – be sure to check it out and don’t be fooled by the name this is definitely a sweet treat! Plus it’s totally yummy! There are blueberries and strawberries hidden right inside this gem! In a bowl dissolve strawberry jello in 2 c. boiling water. Then stir in 2 c. of cold water. Add strawberries. Refrigerate until firm, which is about 2-3 hours. Make sure it is firm before next layer. Put 1/2 c. cold water in saucepan. Sprinkle unflavored gelatin over water. Let stand for 1 minute. Add milk and sugar, cook and stir over medium heat until gelatin and sugar are completely dissolved. Cool this mixture to room temperature then whisk in vanilla and sour cream. Pour over strawberry jello and refrigerate until firm, about 2 hours. Dissolve blue jello and 2 c. of boiling water in a medium bowl. Stir in 2 c. cold water and add blueberries. Spoon this mixture over white layer in trifle bowl. Chill until set about 4 hours. Top with Cool Whip, blueberries and strawberries. I know you made this just for my and my Independence day bday??? Thank you, its beautiful!!! I love the layers and the fruit. I need a giant spoonful right now! Of course! Do you need to ask?! I completely forgot it’s time to start churning out the 4th of July-themed foods! Thanks for reminding me. This is such a pretty parfait, almost too pretty to eat…almost. Love this salad! I’m totally with you on themed food being easier….I’m the same way!! Love this! I make a similar dish, but it has more layers. Yours looks sooo beautiful in that big bowl. My hubby is retired after 20 years of military service…and I decorate my house in red, white & blue. This is perfect! 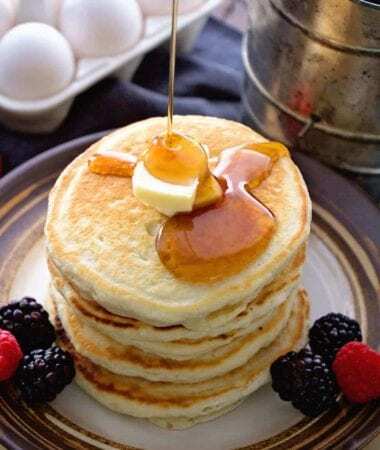 Thanks so much for linking up at Weekend Potluck. Please come back soon. Thanks to your hubby! We are truly blessed to have men and women like him to serve our country! Oh my goodness! So glad you are on top of it since I’m obviously not. It’s been updated! Wanted you to know I am featuring this lovely dish as my personal favorite at Weekend Potluck this week…please be sure to come by and snag the Featured Button. Thanks so much for sharing your yummy food with us. Love the salad recipe. It’s beautiful! It’s never corny to be proud to be an American! This is so pretty Julie!